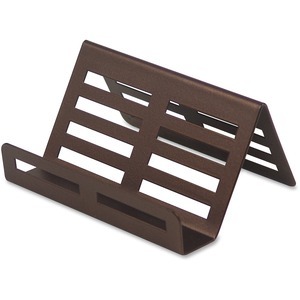 Business card holder offers a unique look with a bronze finish. Use to store up to 50 business cards (3-1/2" wide x 2" high). It is made of stamped steel for durability. Bronze finish matches Lorell's other desktop essentials made of stamped metal with a bronze finish: Letter Tray, Pencil Cup, File Sorter, Memo Holder and Desktop Organizer (all sold separately). Media Size Supported 3.50" x 2"